Australia’s teenage stars have put the team at the top of the elite racing medal table with Melinda McLeod collecting double gold and Darryn Goodwin the time trial crown at the UCI BMX World Championships in Denmark. 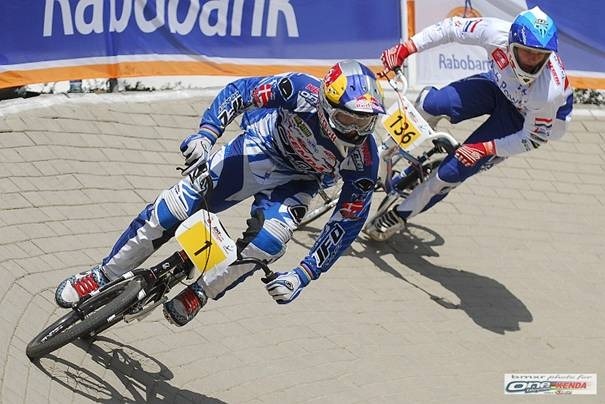 The BMX Cyclones were the only nation to win more than one gold medal and leave Copenhagen with a total of three gold, one silver and one bronze medal from eight Championship Class events. Queensland’s McLeod, 18, opened her campaign on Friday when she won the elite junior women’s time trial Superfinal, the first time this has been a medal event at the championships. A day later she fought back from a bad gate draw to win the race crown rainbow jersey. McLeod launched herself from the gate to hit the front at the first corner (berm). She was challenged at the second corner but a powerful surge over the rhythm section put her back in front. She crossed more than half a second clear of silver medallist Abbie Taylor (GBR) with American Brooke Crain in third place. “It was just a great race out there today,” said McLeod after her win. “I knew it was going to be a tough one so I had a plan A, plan B, plan C, just to make sure I had it covered. McLeod’s dual success is even more impressive considering the Mackay rider had a run in with moped whilst warming up to race on Friday. The win comes after McLeod last year placed third and marks the end of her junior career. Goodwin, 17, won a third gold for the team when he clocked the fastest time in the elite junior men’s time trial Superfinal. In the elite time trial competition Brian Kirkham collected a bronze medal and Caroline Buchanan was second in the elite women’s event. In Saturday’s racing Sam Willoughby and Kirkham both qualified for the elite men’s final but narrowly missed out on podium places finishing fourth and fifth respectively. Australia didn’t qualify a starter in the elite women’s final but in the elite junior men’s final Goodwin and Bodi Turner both qualified. Goodwin placed fourth and 16 year old Turner was sixth. In Birmingham, England for the EC round 9 and 10 that were held in ONE/KENDA’s Simone Christensen from Denmark got 2nd in Junior Women, with Nadja Pries from Germany in 3rd. 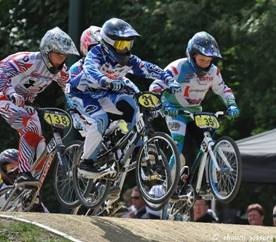 At the Dutch National Championship in Baarn in Boys 12 years old Kevin van de Groenendaal once again won the title. Denzel Vakkers took 4th in Boys 13 years old. Jordy van der Heyden took 8th in Elite Men. In Germany Nadja Pries won the national title in Elite Women. The final rounds 11 and 12 were held in Haaksbergen. Simone Christensen crashed hard in the first moto, breaking her tumb and collarbone. In Junior Women Nadja Pries took 8th place. In Elite Women Aneta Hladikova got 5th. Last years European champion Chris Christensen went to early in the main and hit the gate. He had start from 8th position and was able to make it to 5th. In round 12 Nadja Pries got 3rd and Aneta Hladikova 5th. Jordy van der Heyden took 4th overall in Elite Men and Simone Christensen took 3rd overall in Junior Women. 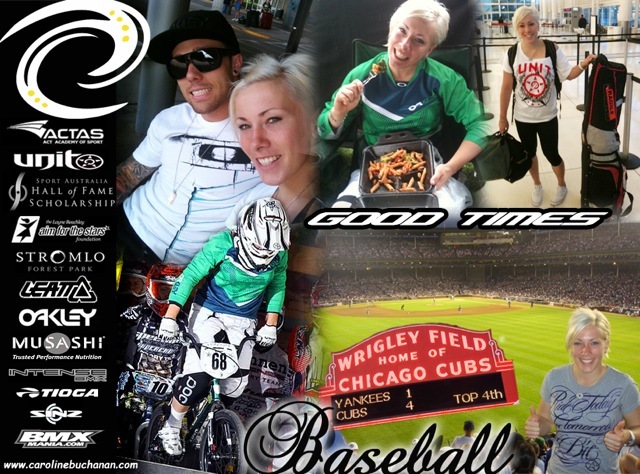 After last months hectic racing schedule it has been so nice to have some relax time in America. 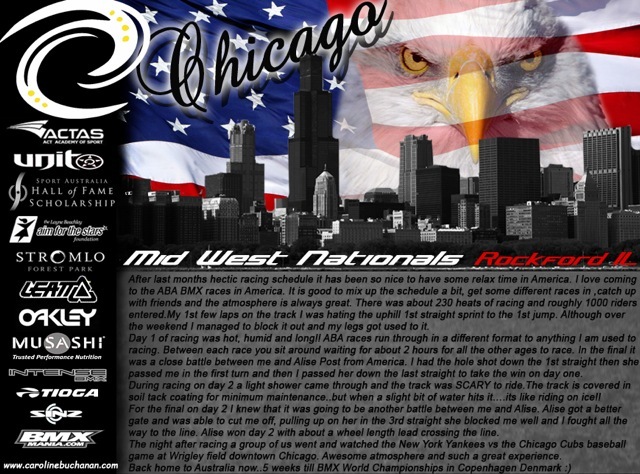 I love coming to the ABA BMX races in America. It is good to mix up the schedule a bit, get some different races in ,catch up with friends and the atmosphere is always great. There was about 230 heats of racing and roughly 1000 riders entered. My 1st few laps on the track I was hating the uphill 1st straight sprint to the 1st jump. Although over the weekend I managed to block it out and my legs got used to it. Day 1 of racing was hot, humid and long!! ABA races run through in a different format to anything I am used to racing. Between each race you sit around waiting for about 2 hours for all the other ages to race. In the final it was a close battle between me and Alise Post from America. I had the hole shot down the 1st straight then she passed me in the first turn and then I passed her down the last straight to take the win on day one. During racing on day 2 a light shower came through and the track was SCARY to ride. The track is covered in soil tack coating for minimum maintenance..but when a slight bit of water hits it….its like riding on ice!! For the final on day 2 I knew that it was going to be another battle between me and Alise. Alise got a better gate and was able to cut me off, pulling up on her in the 3rd straight she blocked me well and I fought all the way to the line. Alise won day 2 with about a wheel length lead crossing the line. The night after racing a group of us went and watched the New York Yankees vs the Chicago Cubs baseball game at Wrigley field downtown Chicago. Awesome atmosphere and such a great experience. It was a good weekend for the ONE/Kenda team worldwide. In Holland, Kevin van de Groenendaal won the Top Competition round 2 in Boys 12 and Denzel Vakkers got 2nd in Boys 13. In France Jordy van der Heijden got 7th in Round 7 of the French Cup for Elite Men, and in Latvia Kristers Lejins won the UCI Category 5 Latvian GP in Elite Men. On the other side of the ocean Gabriela Diaz from Argentina got 2nd in the Panamerican Championship in Colombia. HRVFitness/Speed Taking top Spot at the South Australian State titles. Great weekend of Racing guys, Team HRVfitness/Speed Headed to Mount Gambier for the South Australian Titles. Jaden Rice was in good form and put together some good moto finishes, but when the gate dropped in the final the 10 year old world champion put the pedal to the metal and smashed the competition as he added another title to his already impressive list of achievements. “HRV” Harvey took a back seat this weekend as he starts his run at another National Vet Pro title. Tony Raced in the 30-34 class over the weekend, even though he was a little short on bike skills and managed to put together a good lap and take out the win. Oliver Hoarau looked sharp all weekend, after taking out a few motos it was starting to looking like a Kirkham – Hoarau show down in the final. Brian Kirkham got off to a great start, then decided to move across on the field and set up for the first turn, but moved too fast, hitting Oliver’s bars and then shotting left, taking out the rest of the field. With only three riders left standing, Oliver had some work to do if he was to catch the two front runners. So he put his new SPEED to the test as he dropped the hammer out of the first turn and chased down the two leader. He took the lead into the second turn and Didn’t look back..
Oliver has been working hard in the off season as he ready’s himself for his biggest challenge yet (super cross 2011). Well done to all the guys, fantastic job. Team HRVfitness’s Oliver Hoarau put on a fantastic performance over the recent week of racing in Victoria. The “Track Attack” series started on the 15th of January and ran through till the 23rd. With 6 separate race meets in 9 days, it’s truly a gruelling week of racing. Oli put on a fantastic performance and a consistant week of riding giving him enough points to take the series win. He also came away with final wins at both Lilydale and the final round at Park Orchards. A strong Victorian field with the likes of Tom Siinmaa and Matt Dunsworth, made for some exciting battles. World Champion Jaden Rice was also in there, racing up a class as he prepares for the 2011 season ahead. Jaden put in a big effort for the whole week of racing, after racing two classes and over 40 individual races he still managed to finish second overall in the 12 boys behind Victorian state team rider James Tait. 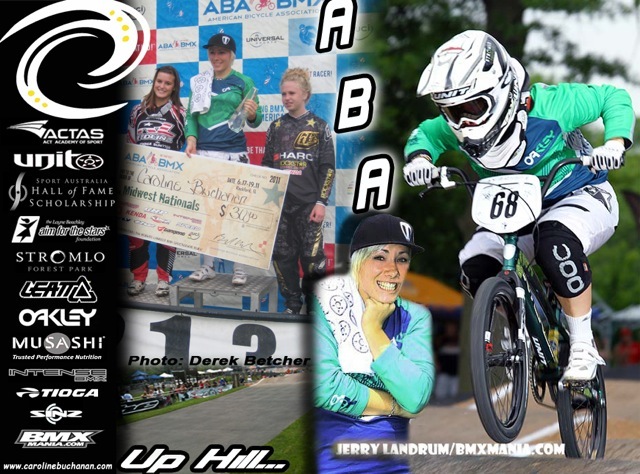 Team HRVfitness Sponsors: Intense, Altegra, Skin Industries, Phire Bird, THE, BMXpress magazine, scott, Strictly BMX. Tampa Bay, Florida was the home to the 3rd ABA National weekend for 2011 and also the North American UCI Continental Championships. The track was reasonably technical and for once riders had to actually make use of the practice sessions to get it dialed in. The first step up proved to be a factor for many as it was a little high for the short legged riders to manual, but yet had too much hang time if you chose to jump it. I preferred the tried and true technique of just stabbing the rear wheel down as hard as possible and hoping to get enough pop over the landing which seemed to do me well for the weekend. The start ramp was also a test of pure horsepower. On this hill you either have it or you don’t. Sitting on the gate which felt almost like flat ground, was awkward to balance at times. This race was also being filmed by NBC Universal and will be airing some time in April and May. Saturdays race was the Continental Championships and I started off strong with 3 holeshots and 3 wins in motos. 41 Elite men turned up for the race which meant we had to endure quarter finals. Sticking to my routine of late, I continued to choose lane 1 throughout the day and again won my quarter and also my semi-final. With some serious Olympic points on the line the pressure was on to get out clean in the main event. Having the faster time through the semi-finals I had first lane pick so slotted back into 1. The gate dropped and I found myself with a slight lead at the bottom of the hill and from there went on to take the holeshot and also the win in front of Sam Willoughby and Corben Sharrah in 2nd and 3rd and becoming North American Continental Champion.After getting a bit lazy on the whole eating during race day thing, I awoke on Sunday feeling the burn after basically redlining myself for all of Saturday. It seems protein shakes, bananas and stupid amounts of caffeine are not the easiest to recover from. The first 2 motos were a struggle but by the 3rd I had snapped out of it and found my groove again. Winning all of my motos, quarter and semi, I again had the fastest time going in to the main and took lane 1. By the time the first turn came I was in the lead and had successfully taken 12 holeshots from 12 starts and then went on to get my first double victory in the US. I also made it 3 ABA wins in a row making it 4 total wins, a 2nd, and a forgettable semi-final blunder for this season. I’m going to be skipping the next Desoto ABA race in March as I will be flying home to New Zealand for the Oceanic Continental Championships the following weekend. Thank you to all my sponsors Speed, Swatch, and Shimano for all your support and everyone else for helping me get here. Toby Henderson, Speed’s founder and a BMX racing legend, introduced the revolutionary 20-Millimeter Speed system last fall with plans to sell it as a Rolling Chassis only. Interest in the system was so strong, however, that he went back to the drawing board and came up with a modular system that will allow almost anyone, regardless of their frame and budget, to take advantage of the benefits of the oversize aluminum axles. Instead of a Rolling Chassis consisting of a frame, forks, wheels, headset and stem, Speed is now selling each piece individually. Only the forks and front wheel must be used together, but they will work on any frame. Even better, the new Speed M-Series 20 frames include two sets of chain tensioner blocks that make them compatible with standard 10-millimeter and 20-millimeter axles. This means a consumer can buy a Speed frame now and use his or her current parts and upgrade to the full 20-Mil system later. CERRITOS, CA—Speed Bicycles took delivery of the first batch of its highly anticipated 20-Millimeter-compatible M-Series 20 frames yesterday. Bikes built with Speed’s 20-Millimeter front and rear through-axle system have been scientifically proved to have significantly less torsional flex while providing racers with a boost in pedaling efficiency. From now on, all Speed frames will feature the 10/20-millimeter-compatible dropout system. “Based on feedback we got from consumers, we decided it made sense to offer the parts individually. Some people wanted to use the forks and front wheel only, others wanted the whole package, but wanted to buy it one part at a time. By making the frames work with any wheels, we made this mostly possible,” Henderson said. “Of course, we think the whole package is the best way to take advantage of the 20-Mil system, but not everyone can do that. Now, you can buy a Speed frame and later upgrade to a Sinz Elite Carbon Pro 20-Mil fork and 20-Mil iHub wheel. And then, even later, upgrade the rear wheel to get the full benefit of the 20-Mil system. Or, just buy a fork and front wheel and put them your current frame,” he added. The 20-millimeter rear wheel will not work with standard frames. Only the Speed M-Series 20 frames can accept the oversize axles used to stiffen the frame and wheel. Speed also found a way to reduce the price of the whole package, dropping it from the announced $1,499.99 MSRP for the Rolling Chassis, to $1,379.99. The MSRP breakdown for the individual parts looks like this: Speed M-Series 20 frame with headset, $399.99; Sinz Elite Pro Carbon 20-Mil fork, $279.99; Sinz Elite 20-Mil front wheel, $249.99; Sinz Elite 20-Mil rear wheel, $449.99; Sinz Elite 20-Mil wheelset, $699.99. The Rolling Chassis, when purchased all at once, is $1,379.99 and includes a free Sinz stem. This year it was held on the 22nd and 23rd of January. ONE/Kenda’s World Champion Chris Christensen from Denmark was present with his sister Simone and Rowdy van Harsel was going to race Junior Men in his first year. New in the team and also present were Jasper Peters, Nadja Pries from Germany and Denzel Vakkers who made the switch from the Junior ONE team to the ONE/Kenda team. Chris Christensen won both saturdays and Sundays event in 15yo Boys. Denzel Vakkers took 3rd and 2nd in 13yo Boys.In the combined Junior/Elite class, Nadja Pries took a 3rd on Saturday and Sunday, withSimone Christensen in 4th and 5th place. Max Egdorf: With 8 racks in the 19-27x class, Max was the “Man” in Reno pulling a 2nd on day 1 and bumped up one spot to the top of the podium on day 2. Devon Yeager: Our newest “little” guy rode large on day 1, taking home the victory in 9X. Shawn DiPrete: Luckily his “Roynuts” issues didn’t happen on the big bike, as that’s what we had him penciled in for. Two main event wins for Shawn in 36-40 cru. Austin Loebe: Austin dominated the 17-18 expert class in Reno, picking up the main wins both days. Alex Anthony: Overcame some day 1 bad mojo and rocked his way onto the Podium in the “A” pro class on day two for a 2nd place finish and the fourth good score we needed for the sheet. Justin Wike: Also made his team debut in Reno and did more then just win the 26-35 expert class on day 1; he was a top player in the stacked 17 & over expert class both days also. Thanks again for the hospitality, Justin! Hoping to continue our early-season success, look for us in Oldsmar, FL for the ABA Gator Nationals. Our next NBL team event will be at Shayne Robinson’s track in Peachtree City, GA just South of Atlanta, for the next installment of the team “Cat 2” series on March 19th & 20th. Special thanks to Errol and Donna at Delta Cycle (www.deltacycle.com) for keeping us stocked up with the great Aztec brake pads and cables! Also, Mark at Riderz Ready (http://riderzready.com) for the outstanding customer service and support with our recent team jersey orders. Currently, only the 20-Millimeter-ready frames are available. Forks and front wheels are expected to be in stock next month with rear wheels to follow soon after. “The rear hub is really the crux of the project. We have had very successful tests on all our sample hubs and Nick Koehler is racing on one. But before we release them to the pubic, we want to make sure they are right. We’re really, really close,” Henderson said, adding that he is working with several hub makers in the hope of adding an American-made hub set to the line. The new 10/20-Mil frames have slightly different graphics, although the red/black paint scheme remains the only available color. The new head badge features the Speed “Bar-Code,” while the seat and down tube graphics got a new twist. Each frame includes a Sinz headset; anodized, aluminum, 10- and 20-millimeter tensioner blocks and a set of tensioner bolts.